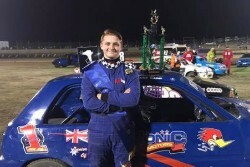 Ardie Jonic, Australias most credentialed Junior Sedan driver of all time, continued his dominance on Saturday night at the Solo, Hobart Speedway, when he won his tenth Junior Sedan State Title, his second Tasmanian Title, three years after he won his first Title in 2016. Jonic would win all three of his qualifying heats and would start on pole for the twenty lap A Main, with Jayden Triffett, who won two preliminaries. Cody Gay, who also won two qualifying heats, would start from position three, with Mitch Colgan starting from position four. Jonic took the lead from the very start of the race, and he would be first to the chequered flag. Colgan was able to pass Gay on lap three, after which time the top four positions remained unchanged, despite a couple of stoppages. Jonic was able to hold a handy buffer over Triffett, who had his hands full with Colgan in the concluding stages, who was able to shrug off the challenge from Gay who would finish fourth. Stevie Smith, Sharni Farrell and Lachlan Robins all drove well to be the final drivers on the lead lap.